Is the Kindle Fire about to get even cheaper? The popular Amazon Kindle Fire may be about to get even cheaper if plans to introduce an ad-supported model are implemented. According to AdAge, the online retail giant is exploring the possibility of placing ads onto the welcome screen of the Kindle Fire, with the ad income subsidising the cost of the hardware. 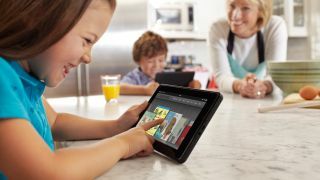 The Kindle Fire is Amazon.com's best selling product, but that's clearly not enough, as the company looks to cash in further with ad packages on the tablet rumoured to start at $600,000 (around £380,000) for companies looking for Fire-based promotion. This is by no means a new direction for Amazon, which already offers cheaper versions of its popular Kindle e-readers in the US, which sport full-screen adverts in the form of sponsored screensavers. You have to put up with a few ads but it saves you a few bucks on the hardware. There's no word on how much an ad-enabled Kindle Fire would retail for, but the Kindle Touch with "Special Offers", as Amazon likes to call it, is $40 (around £25) cheaper than its ad-free counterpart. This could mean we see a Kindle Fire available for $150 (around £95) – which would be very reasonable for an Android tablet - although none of the ad-supported models have made it to any countries other than the US so far. Speaking of which, the Amazon Kindle Fire is currently only available in the US too, but we expect the upcoming Kindle Fire 2 tablet to roll out to other markets around the world if it's released later this year.